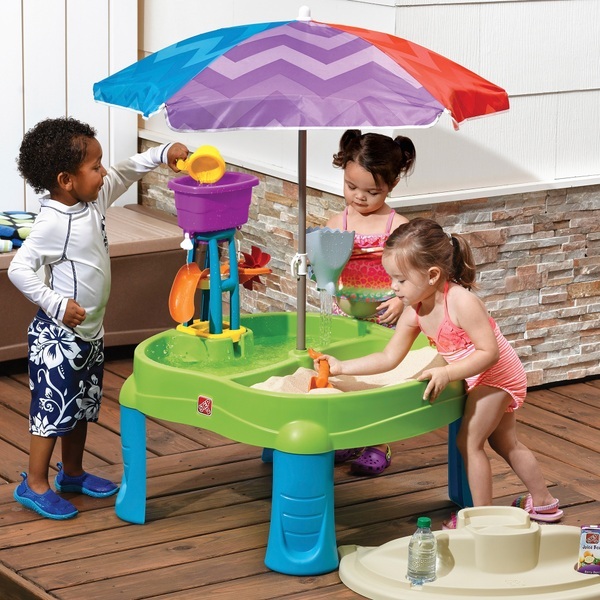 Bring the beach home with the Step 2 Splash & Scoop Bay Sand and Water Table! This sand and water table with 5 accessories will allow your little ones to have fun with sand, water or both, for great all-around imaginative play. Kids can use shovels or their hands to dig in the sand and splash around in the water, developing their fine motor skills and discovering textures through sensory play. The included shark scoop is perfect for pouring water and imaginative sea play, while the shovel and rake tool is ideal for beach fun with the sand. The water tower with a slide, a spinner and a removable cup can be added to the mountain shaped cover. Then simply add water to create an amazing waterfall! The Step 2 Splash & Scoop Bay Sand and Water Table features two sections, to keep your sand and water separate, cutting down on mess. The table has a drain plug for easy cleaning and a cover that fits over either side of the sand and water table. This cover is cleverly shaped as a mountain fo an extra element with which to play. The included umbrella is perfect for keeping kids in the shade as they play. Kids will love playing in the back garden with the brightly coloured Step 2 Splash & Scoop Bay Sand and Water Table.